We all want to enjoy better health and one way to do that is by supporting and healing your gut with food. 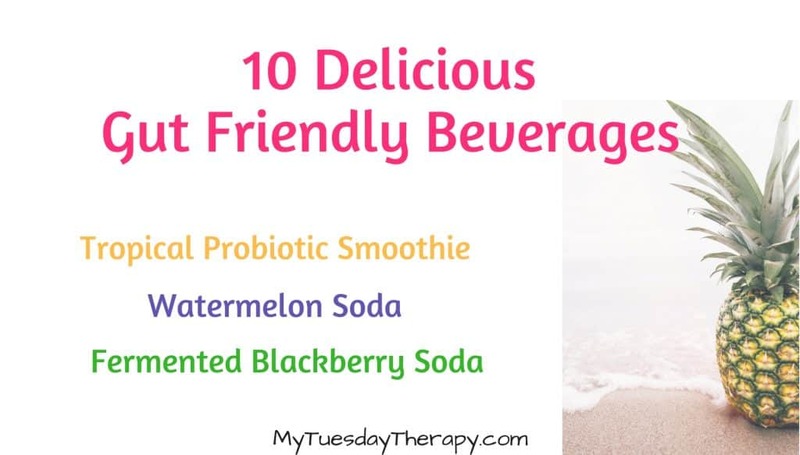 You’ll find here several ideas for tasty and good for you beverages that can help you to feel your best. Who wouldn’t enjoy a glass of sparkling apple cider or a smoothie that transports you to the paradise! NOTE: THIS POST HAS BEEN UPDATED. SOME OF THE IMAGES AND BEVERAGE IDEAS ARE NO LONGER HERE. Consult your healthcare provider before starting any treatments including using gut healing foods. Disclaimer. Naturally Sparkling Apple Cider (from RealFoodFamily.com) is made with only two ingredients. You can lacto-ferment any juice and it is really easy. You will wonder why you didn’t do it sooner. Lacto-fermenting involves bacteria called Lactobacillus. They convert lactose and other sugars to lactic acid which is helpful in fighting against bad bacteria. Old Fashioned Rootbeer (from WellnessMama.com) requires more ingredients and a bit more time but the health benefits are worth the extra time. This beverage made with herbs such as sassafras and sarsaparilla can give your immune system a boost. This rootbeer would be an awesome alternative to the soda you get from the store. Fermented Elderberry and Honey Soda (from Empowered Sustenance) is as the name says made with elderberries and honey. Both of these boost your immune system and reduce inflammation. Fermentation enhances their healing qualities. Elderberries are antioxidant and have a good amount of Vitamin A which is why elderberries are recommended for skin problems. This yummy goodness is made with real peaches not juice. Fermented Blackberry Soda (from AndHereWeAre.com) is another awesome, easy, and cheap lacto-fermented beverage. Blackberries contain a huge amount of nutrients. They have a high vitamin C content and a good amount of manganese and vitamin K. Since these berries are full of antioxidants they are naturally anti-inflammatory. Watermelon Soda (from FermentationPodcast.com) is another beverage that is so perfect for the summer! Though watermelons are mostly water they still hold a variety of nutrients e.g. vitamin C and A. These melons are also known for being anti-inflammatory. Apple Pie Smoothie (from CulturesForHealth.com) is a lovely combination of apples and cinnamon. An apple a day… you know how it goes. This yummy fuit is full of antioxidants and fiber. Apples are anti-inflammatory and good sources of vitamin C. An excellent fruit for the gut health! The flavors of this Tropical Smoothie (from Traditional Cooking School) will make you feel like you are sitting at a beautiful beach listening to the ocean. Mango, pineapple and coconut… Aloha! Mangoes are great for the immune system. They have a high vitamin C content and also a good amount of vitamin A. Same goes for the pineapple. Coconuts are of course known for their anti-inflammatory, gut healing proprieties. Can’t go wrong with this delicious gut healing smoothie. This Blueberry Smoothie (from MindBodyGreen) contains also avocado. Avocados are rich in fiber and promote good digestion. Some of the fiber is also prebiotic meaning it is food for the probiotics. Blueberries have something called polyphenols. Polyphenols are a compound found in plants. They increase the amount of beneficial bacteria such as Lactobacillus and Bifidobacteria in the gut. And last but not least is Chocolate Kefir Smoothie (from Traditional Cooking Schools). Who could resist this chocolaty kefir smoothie with added benefits of fruit and coconut oil! Dark chocolate boasts many health benefits. It is rich in antioxidants and it is also said to increase the amount of healthy bacteria. The more beneficial bacteria you have the better. This set comes with three funnels and a strainer. The funnels make it a breeze to fill up the swing top bottles. The set also nests for an easy storage. Keep your bottles nice and clean with this durable bendable brush. I have this blender/smoothie maker. I like the Auto-IQ function: timed, blending programs. This blender is also way quieter than the blender I owned before. And it always does a good job! The cups with Sip & Seal lids have been handy too. Another popular, little more expensive blender is Vitamix. You can easily adjust the speed to get the texture you want. You can even change the speed in the middle of blending. And it even pulverizes the tiniest seeds. You will get rich, yummy smoothie every time. As and additional bonus feature you can even make steaming hot soup with the blender because the blades spin fast enough to create friction heat. This jumbo pack has 300 reusable straws in five different colors. These straws are wide enough for thick smoothies. If 300 is too much get the pack of 100.